Al Ula is one of the oldest cities of Saudi Arabia situated at around 110Km southwest of Tayma. The city is known for its archeological beauty and monuments. In an earlier post, we have shared some of the Best Places to Visit in Al Ula. In this post, we shall talk about the Elephant Rock. Elephant rock is an interesting place to visit and one can hold camping there as well. 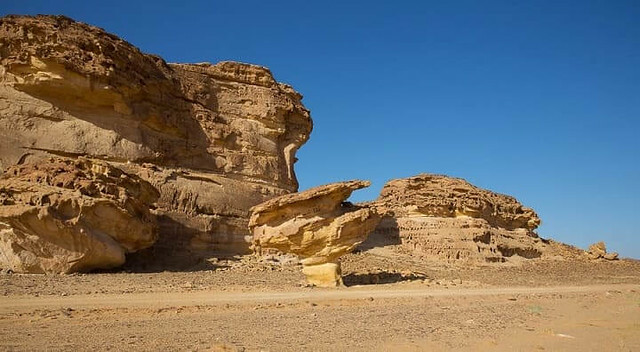 At the North of Al Ula at a distance of 11km lies the Elephant Rock. It is a monolith rock made of soft and red sandstones. 1-The elephant rock also is known as the Jabal Al Feel in one of the sites that can truly amaze its viewers. 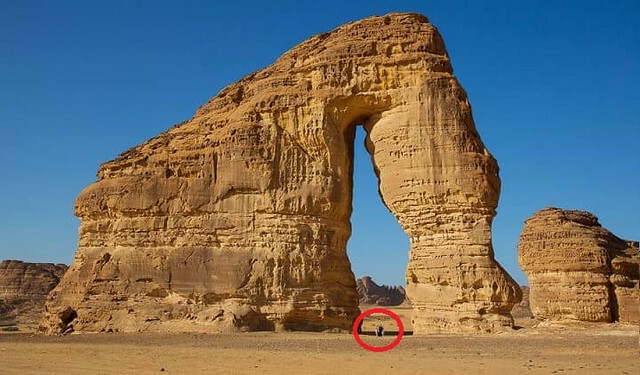 The rock is located near the Madain Saleh, Al Ula. 2-The elephant rock seems to have an eye made naturally out of carved rocks (Subhan Allah). The rock is so huge that people look like tiny creatures standing with it. If you ever visit the rock and take a picture with it, you will feel that some tiny thing is standing beside the rock. 3-It is a huge and gigantic rock that is 50 meters above the ground! It is not only its size that makes it unique and astonishing but it is its unique design. The shape of the rock resembles that of an elephant. 4-Reaching the site is not difficult, one can take along their cars with them or can pay a visit after a short walk. I recommend people to do pay a visit to the interesting site. 5-A signboard engraved with its local name “Jabal Al Feel” also stands by the rock to make it prominent. The elephant rock rests in the middle of great mountains and sand of golden color. 6-Besides the elephant rock, rests a stack of stones that is another interesting piece of art. Its shape resembles that of a mushroom or a spinning top. (Masha Allah). Do visit the place guys, you will be amazed to see the rock formations. Also, for those who enjoy desert sports and mountain climbing, this is a perfect spot for all of you! The best time to come: However, it is best to visit in the morning (like at 7 or 8) because the sun is bright at that time and pictures taken are just perfect in that brightness. Moreover, it is not a good idea to visit the place in the during summer. Perhaps, the best time to visit Al Ula area is winter.